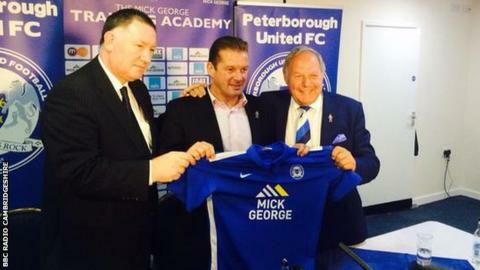 Peterborough United boss Graham Westley tasted defeat in his first home game as his 10-man side lost out to Bury. Posh had Erhun Oztumer sent off for a late challenge on Craig Jones after 24 minutes and Leon Clarke soon struck to put the visitors ahead. But two headers by Gaby Zakuani - one just before the break and one just after - put the home side ahead. A fine Nathan Cameron volley drew Bury level and substitute Tom Pope headed a late winner with his first touch. Match ends, Peterborough United 2, Bury 3. Second Half ends, Peterborough United 2, Bury 3. Callum Elder (Peterborough United) wins a free kick in the defensive half. Attempt missed. Jon Taylor (Peterborough United) right footed shot from the centre of the box is too high following a corner. Corner, Peterborough United. Conceded by Nathan Cameron. Attempt blocked. Marcus Maddison (Peterborough United) left footed shot from long range on the right is blocked. Attempt missed. Marcus Maddison (Peterborough United) right footed shot from the right side of the box is close, but misses to the right. Corner, Peterborough United. Conceded by Chris Hussey. Attempt blocked. Jon Taylor (Peterborough United) right footed shot from the right side of the box is blocked. Goal! Peterborough United 2, Bury 3. Tom Pope (Bury) header from the centre of the box to the bottom right corner. Assisted by Chris Hussey following a corner. Substitution, Bury. Tom Pope replaces Danny Rose. Corner, Bury. Conceded by Ben Alnwick. Attempt saved. Danny Pugh (Bury) left footed shot from outside the box is saved in the top left corner. Attempt missed. Tom Soares (Bury) header from the centre of the box is close, but misses to the right. Attempt missed. Michael Bostwick (Peterborough United) right footed shot from the centre of the box is high and wide to the right following a corner. Corner, Peterborough United. Conceded by Robert Lainton. Attempt saved. Marcus Maddison (Peterborough United) left footed shot from the right side of the box is saved in the bottom right corner. Corner, Bury. Conceded by Gabriel Zakuani. Attempt blocked. Chris Hussey (Bury) right footed shot from outside the box is blocked. Attempt saved. Joe Riley (Bury) left footed shot from long range on the right is saved in the top left corner. Attempt saved. Hallam Hope (Bury) right footed shot from outside the box is saved in the top centre of the goal. Attempt missed. Peter Clarke (Bury) left footed shot from the centre of the box is close, but misses to the right following a corner. Corner, Bury. Conceded by Marcus Maddison. Substitution, Peterborough United. Conor Washington replaces Lee Angol. Goal! Peterborough United 2, Bury 2. Nathan Cameron (Bury) right footed shot from the centre of the box to the top right corner. Assisted by Leon Clarke. Corner, Bury. Conceded by Jon Taylor. Corner, Bury. Conceded by Michael Smith. Foul by Lee Angol (Peterborough United). Hallam Hope (Bury) is shown the yellow card.